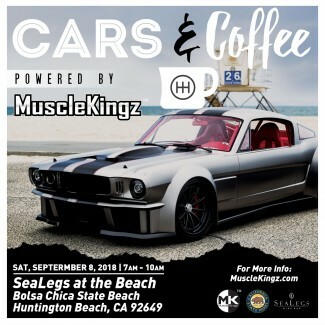 Sammy Hagar's High Tide Beach Party & Car Show is hosting a “Cars & Coffee” event, powered by MuscleKingz. 100+ car enthusiasts will display their customized, classic, supercars and more for a chance to be chosen to showcase at Sammy Hagar's High Tide Beach Party & Car Show on Saturday October 6. Owners and enthusiasts will vie for a limited number of spots to showcase their best alongside famed cars like Sammy Hagar's “I Can't Drive 55” Ferrari, the Million Dollar Mustang 'Vicious Stang', David Lee’s Custom Ferrari Dino and many more.